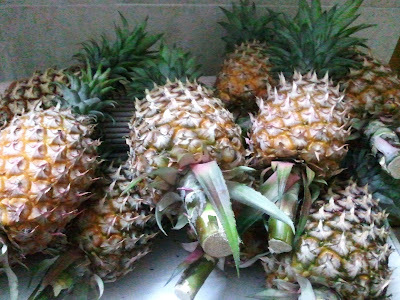 I love eating pineapple fried rice.But I have never attempted in making it on my own.Until last night that is when I came back from work and saw so many pineapples in the kitchen!My dad's friends has his own orchard and he gave us lots of it. 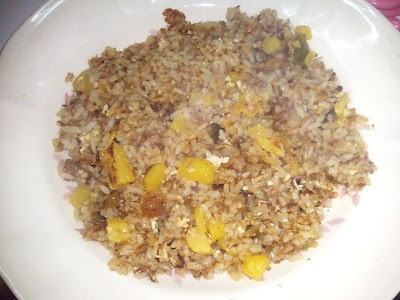 So since I just came back from work and was hungry,I made my favorite fried rice dish,pineapple fried rice. I pounded the garlic,shallot,dry anchovies & bird's eye chilli using the pestle & mortar(lesung batu in Malay) because to me it imparts a better flavor than using a blender. I heated up some extra virgin olive oil in the pan,since there was a lot of the oil lying around(it's good for your health,complexion & hair!! ).Put in the pounded mixture & add in the chopped fresh pineapples along with some golden raisins(what's pineapple fried rice without golden raisins?). Add the rice & 1 beaten egg.Season with a bit of salt and Kikkoman soy sauce.Ready to eat!